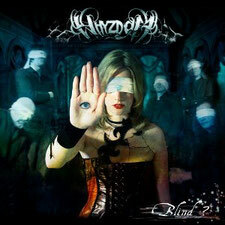 French symphonic metal band WHYZDOM will released the new album "BLIND?" on October 30 through Scarlet Records. The band was founded by the guitarist and orchestrator Vynce Leff in early 2007. The band, which is known for their own signature approach to Symphonic Metal, blend once more intricate orchestral parts (including all the subtleties of strings, winds, brass, classical percussions, piano, harp etc.) and a real choir with the power of Heavy Metal. The album title not only refers to the blindness of people towards what’s happening around them, but also to the fact that we, as humans, often deliberately choose to be blind in many uncomfortable circumstances that eventually lead us on the wrong path of life. "BLIND?" was produced by Vynce Leff, recorded and mixed at Powermania Studio in Paris and mastered by Mathieu Gillon and Vynce Leff at 120dB Studio. The stunning artwork is the result of a collaboration between X-Nihilo Design, Les Créations Vultus and Florent Cuaz. You will like their music, if you are a fan of music such as Epica, Within Temptation, Nightwish, Therion and Evanescence.